‘Ruby Flew Too’ is a really cute picture book for little children. It is written by Jonathan Emmett and illustrated by Rebecca Harry, and tells the story of a family of ducks. The story starts with Mother Duck and Father Duck tending their nest where there are five eggs ready to hatch. Mother Duck sits on the nest all day and all night through all kinds of weather looking after all the eggs and waiting for them to hatch. One day the eggs start to hatch…one, two, three, four of them and soon there are… one, two, three, four little ducklings all cuddly and feathery! Mother Duck and Father Duck decide to call their little ducklings Rufus, Rory, Rosie and Rebecca. As the ducklings start to find their feet they learn to do all sorts of things like eat and swim. The four eldest ducklings take off and eat everything in sight, and swim everywhere and anywhere. However, poor little Ruby doesn’t seem to do so well. At first she eats nothing and swims nowhere. Father Duck looks at her and wonders whether she will ever be able to do the things that the other ducklings are doing. Mother Duck reassures him that she will but…in her own time! And, sure enough, she does do all these things, if a little later than her brothers and sisters! All the ducklings grow bigger, and soon it comes to the time when they will start to learn to fly. When the day comes Rufus, Rory, Rosie and Rebecca all start off and take to the skies, flying. And guess what? So does Ruby! Not only did Ruby fly too, but she flew further and higher than her brothers and sisters. Mother Duck and Father Duck watch her flying into the distance and this time it is Mother Duck who wonders ‘will she ever come back?’ and in turn is reassured by Father Duck that of course she will, but in her own time! Which of course she does! I love this book for a number of reasons. Firstly, although the story is quite simple it does convey a strong message – that it’s not how you start it’s how you finish! Lots of children may be slower than others at learning lots of new skills, but this doesn’t matter. Chances are that they will all catch up with each other in the end and they will all find something they are good at! I think this story is good to share with children who might be worrying about that sort of thing! Also, the illustrations in this book are lovely. You can see from the picture on the front cover that the colours are bright and vivid, which they are all the way through. The pictures are really appealing and they are painted in such a way that they are all soft round the edges! I think the pictures really work at helping to tell the story. Also, at times the author does interesting things with the text. He emphasises some words by making them bigger and in capitals, and more interestingly, when Ruby is flying the words are not written in a straight line, but rise and fall like the movement of wings. Young children, who are just starting to take notice of the words on the page, will love this. There is also quite a lot of repetition in the story with certain words which children can join in with. This is particularly true when both Mother Duck and father Duck say ‘in her own time!’ This helps children to be able to tell the story themselves and my daughter manages to join in with this and say it in such a way that makes her seem wise beyond her years! Because there are five eggs and five ducklings these pages can also help children with their early counting, and all the names starting with ‘R’ will help children start to recognise sounds. 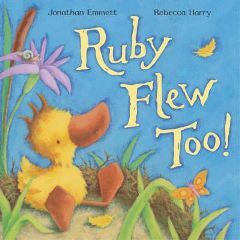 Overall, ‘Ruby Flew Too’ is a lovely book for small children and is one that they will probably want you to read over and over again! One Comment on "Ruby Flew Too"